We have all done it. We started messing with code and changed it to the point where it just won’t work anymore. If you employ some kind of version control or backup you usually have some kind of previous version to save the day, but that really depends on how diligent you are with checking files into source control. Oh yeah, I know you wished you had made a copy of that file before you started messing with it. PrimalScript 2014 does that for you now, so stop worrying. 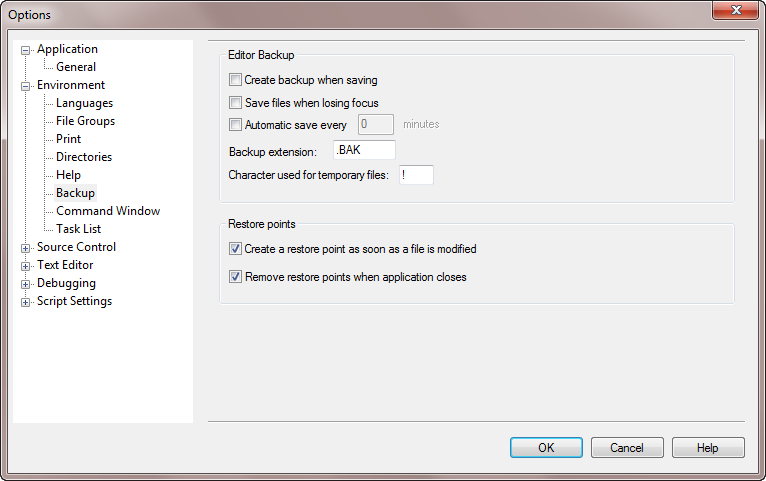 The Backup properties now have additional settings, all turned on by default. You get two kinds of restore points; automatic and manual. The automatic ones are created as soon as you start modifying a file. 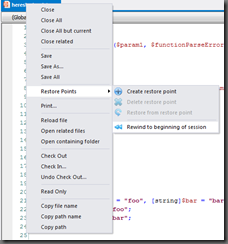 The document tab context menu has a new topic; Restore Points. Just hit Rewind and PrimalScript 2014 will copy the temporary file back and load that, discarding anything you have done so far. The second way is to use the Tools tab in the Ribbon. Just hit “Rewind”. And no, we did not but any hotkeys to any of this, we wouldn’t want an errant mistyped key to eradicate everything you did since the morning, would we? Again, the file is hidden and unless you have hidden files turned on you won’t even see it. 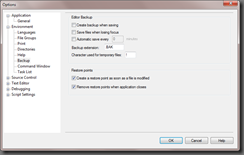 Unlike temporary restore points these files are not deleted at the end of a session. 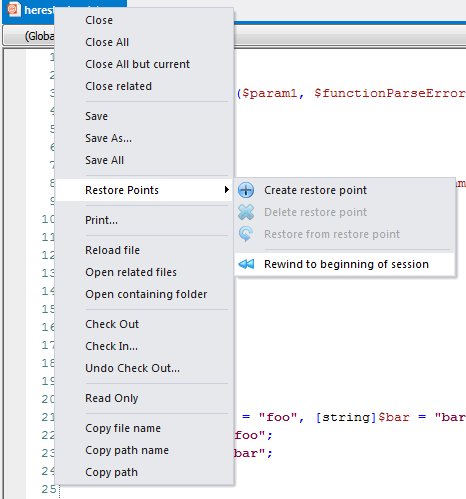 This will only be deleted when you select Delete from the tab context menu or the Ribbon. So now even days later you can restore to a known state in just one click. If you hit Create restore point again, PrimalScript will just quietly update the restore point to the current state. So there are no multiple versions of that file. If you want versions, you still need to use some kind of version control. It’s not really a big feature, but we hope it can help you out here and there when you coded yourself into a corner. Ganpisetty Srinu liked this on Facebook.